Are you looking for literature to support classroom instruction about Immigrants? Check out Our Editorsâ Choices for titles recommended by the Education World team. Then it's your turn to share books that you enjoy or use in your classroom in the Our Readersâ Voices section below. With your help, we will build the best list on the Internet of Best Books for teaching about Immigrants. Ellen Levine offers a comprehensive, well organized discussion of the immigration procedures followed at Ellis Island between 1892 and 1914. One- or two-page chapters offer concise answers to questions ("What did people bring with them? '; "What happened if you were detained? "; "How did people learn English? 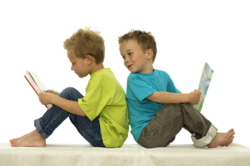 "), enabling youngsters to digest easily a significant amount of information. Facts about the many rigorous routines and tests that new arrivals endured are peppered with the intriguing personal reminiscences of individuals who lived through them. (Publishers Weekly) Part of the If You. series from Scholastic. This book describes the experiences of the many immigrants who sought entry to the United States at the immigration station on Ellis Island, New York, before it closed in 1954. It contains four succinct and interestingly written overviews. Well-chosen archival photos and reproductions are interspersed with full-color modern-day shots to create a pleasing layout; the print is large and easy to read. (School Library Journal) Part of the Cornerstones of Freedom series from Children's Press. From a basket of old clothes, Anna's babushka, Uncle Vladimir's shirt, Aunt Havalah's nightdress, and an apron of Aunt Natasha's become The Keeping Quilt, passed along from mother to daughter for almost a century. For four generations the quilt is a Sabbath tablecloth, a wedding canopy, and a blanket that welcomes babies warmly into the world. In strongly moving pictures that are as heartwarming as they are real, Patricia Polacco tells the story of her own family and the quilt that remains a symbol of their enduring love and faith. Renowned photo-essayist Freedman has written two books, Kids at Work and Immigrant Kids, that speak to children through engaging text and pictures. This book captures images of newly arrived children at work, play, and learning. Children can extend their appreciation of it by collecting photographs of their peers to document their own lives at school. These photo-journals can be combined with items representing contemporary lifestyles to create a time capsule that may be stored for future generations attending the same school. Add your voice to our list of books for teaching about Immigrants. The Education World Editorsâ Choices above represent just a handful of the fine books that might be used to support classroom instruction about Immigrants. Now weâre waiting for you to add to our list. Simply send us your review of a favorite book in 100 words or fewer and we will add it to the Readersâ Choices below.